The BMW Vision Future Luxury Concept is the highlight over at BMW’s Beijing Motor Show 2014. 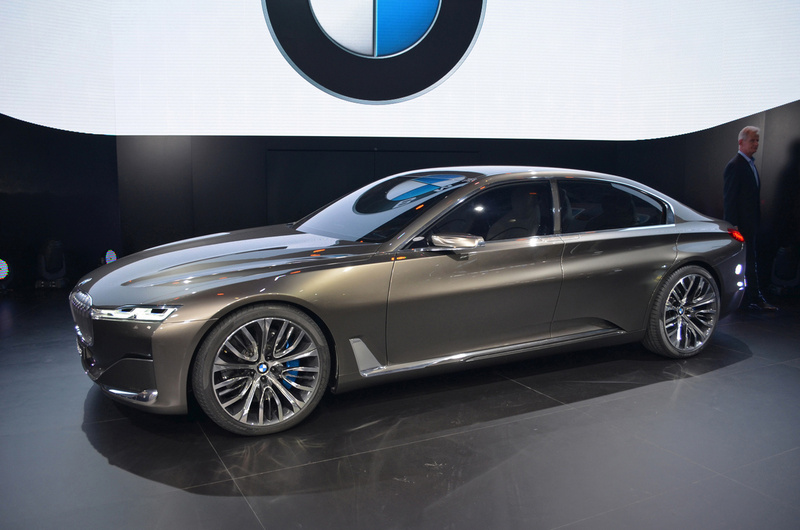 There was some suggestion that the BMW Vision Future Luxury Concept would preview a planned 9-Series model. While we aren’t quite sure about that yet, the concept does preview some fantastic new technology and BMW’s future luxury direction. We took a closer look! The BMW Vision Future Luxury Concept features a long wheelbase, short overhangs and a hand-sculpted design. The paintwork is Liquid Platinum Bronze. This is the first BMW to feature OLED rear lighting. At the front, this concept uses BMW’s brand new Laserlight technology. The BMW Vision Future Luxury Concept gets a coupé-style roofline and sloping boot lid. The BMW Vision Future Luxury has been designed using the design principle of subtractive modelling. Basically, this principle is akin to layering. The Future Luxury concept gets a fine carbon fabric base level, followed by a functional level with various interfaces and functions, then a structural, load-bearing layer of aluminium and finally an ergonomic layer of wood and leather for comfort. For a full explanation of the BMW Vision Future Luxury Concept, take a look at our earlier article. For full news from the Beijing Motor Show 2014 stay tuned to our dedicated news channel!